I was inspired by the autumn theme and colors. Thank you for looking and commenting ... your comments are most appreciated. Now I have to say I really like that hat! What a darling little Thanksgiving tag and sweet image. Thanks for joining us at Tag You’re It! Awww. your little girlie is adorable!! Your sweet tag is just charming! I love how you stamped the image on craft cs. Thanks for joining in on the fun over at Tag, You're It! Cute! 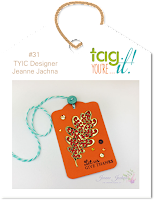 Thank you for joining us at Tag You're It Challenge. Congrats on the prize you won!! !